Above: A positive image of supernova SN2014dj in Galaxy NGC 317B. Image courtesy of Doug Rich. Supernova 2014dj was discovered by the Eagle Hill Supernova Search Project led by Doug Rich. Team members Doug Rich, Thomas Harvey, Michael Marion, Joe Rosebush, and Charlie Sawyer conducted the blink comparison that resulted in the discovery. Spectroscopic analysis of the supernova was conducted by astronomer Andrea Pastorello and his team with the Italian National Institute for Astrophysics in Asiago, Italy. The supernova was then designated 2014dj by the Central Bureau for Astronomical Telegrams in Cambridge, Massachusetts. Supernova 2014dj was the 114th supernova discovery reported by CBAT in 2014. CBAT Director: Daniel W. E. Green; Hoffman Lab 209; Harvard University; 20 Oxford St.; Cambridge, MA 02138; U.S.A. e-mail: cbatiau@eps.harvard.edu (alternate cbat@iau.org) URL http://www.cbat.eps.harvard.edu/index.html Prepared using the Tamkin Foundation Computer Network SUPERNOVA 2014dj IN NGC 317B = PSN J00574018+4347342 D. Rich, Hampden, ME, U.S.A, reports his discovery of an apparent supernova (mag about 17.0) on unfiltered CCD frames (limiting mag 19.3) taken with a 0.41-m reflector on Sept. 24.150 and 25.109 UT in the course of the Eagle Hill Supernova Search Project. The new object is located at R.A. = 0h57m40s.18, Decl. 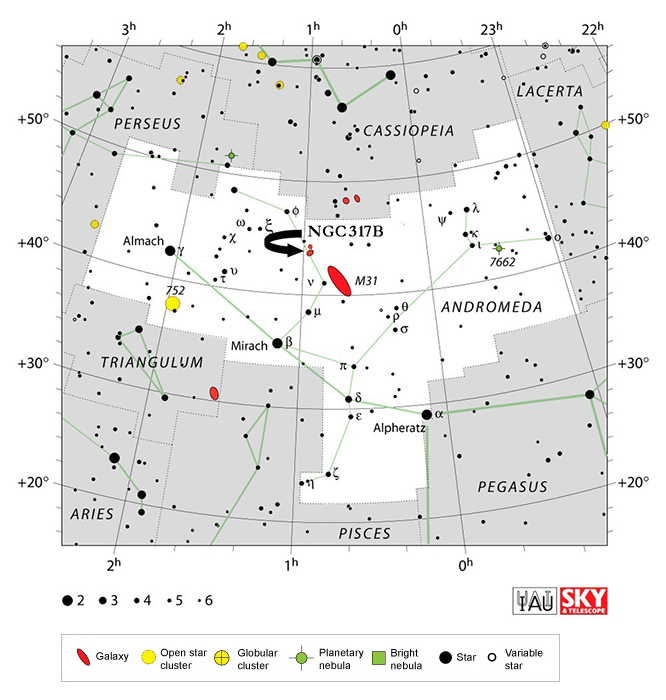 = +43o47’35″.1 (equinox 2000.0), which is about 2″.4 west and 3″.1 north of the center of NGC 317B. Nothing is visible at this position on Palomar Digitized Sky Survey images from 1989 Oct. 5 (limiting red mag about 20.3) and 1989 Aug. 31 (limiting blue mag about 21.2). 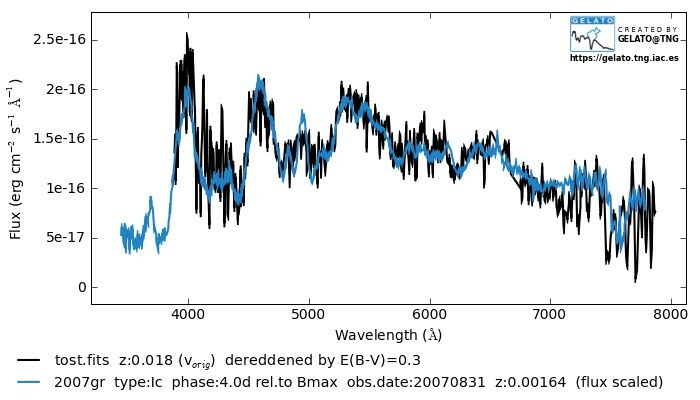 The variable was designated PSN J00574018+4347342 when it was posted at the Central Bureau’s TOCP webpage (based on an earlier measurement for the declination by Rich) and is here designated SN 2014dj based on the spectroscopic confirmation reported below. The type-II supernova 1999gl also appeared in NGC 317B (cf. IAUC 7333). Additional unfiltered CCD magnitudes for 2014dj: Sept. 4.235, [19.1 (Rich); 25.892, 17.7 (G. Masi and P. Catalano; remotely using a 43-cm telescope at Ceccano, Italy; position end figures 40s.15, 34″.9). L. Tomasella, N. Elias-Rosa, P. Ochner, L. Tartaglia, S. Benetti, E. Cappellaro, A. Pastorello, and M. Turatto, Osservatorio Astronomico di Padova, Istituto Nazionale di Astrofisica, report that optical spectroscopy (range 340-820 nm; resolution 1.3 nm), obtained on Sept. 26.88 UT with the Asiago 1.82-m Copernico Telescope (+ AFOSC) under the Asiago Transient Classification Program (Tomasella et al. 2014, A.N. 335, 841), shows that PSN J00574018+4347342 = SN 2014dj is a type-Ic supernova. Assuming for the host galaxy (NGC 317B) a recessional velocity of 5429 km/s (Strauss et al. 1992, Ap.J. Suppl. 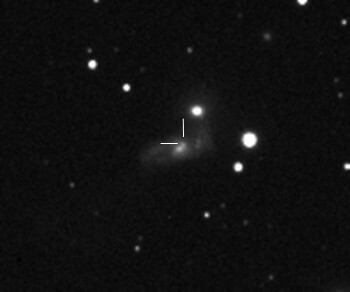 83, 29; via NED), a good match is found with the type-Ic supernova 2007gr (Valenti et al. 2008, Ap.J. 673, L155). The Asiago classification spectra are posted at website URL http://graspa.oapd.inaf.it; classification was made via GELATO (Harutyunyan et al. 2008, A.Ap. 488, 383) and SNID (Blondin and Tonry 2007, Ap.J. 666, 1024). 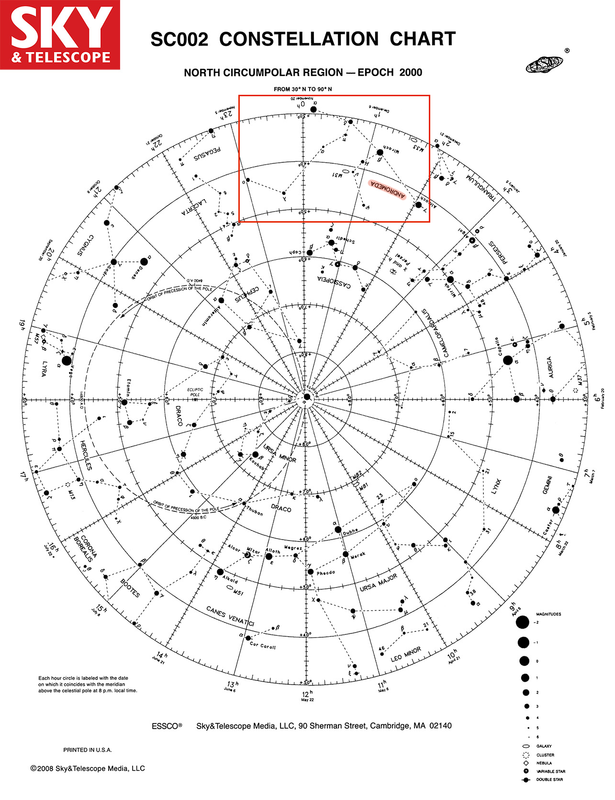 Copyright © 2019 Maine Astronomy Reports. All Rights Reserved. Magazine Basic created by c.bavota.